YouTube stopped working on Google Chrome? Before you make some support call, try your own hand at digging out methods to the error. I've gathered most common problems you may encounter when playing YouTube on Chrome, as well as effective solutions on how you can fix Google Chrome YouTube not working by yourself, like YouTube videos no loading, not playing in Chrome etc. 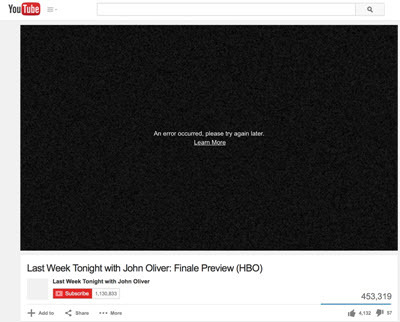 If you download YouTube videos for offline watching, the error that YouTube doesn’t work on Chrome can be avoided. MacX Video Converter Pro, the best YouTube downloader for Chrome I’ve found so far, is highly recommended. It downloads YouTube videos movies TV shows of MP4, AVI, FLV, 3GP, MOV etc. 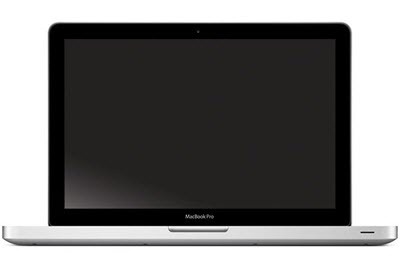 in 720p, 1080p HD, 4K, 4320P without any hassle in a few seconds, free you from any errors. The program can download videos from 1000 other sites on macOS (Mojave included) and Windows 10. 1 to get rid of Google Chrome YouTube problems, free download the best YouTube downloader for Chrome and run it on you computer. 2 Copy and past the video URL to the box frame, click "analyze" to load the video, choose output resolution and format as you like, and select an output folder. 3 Hit "Download Now" button and start download YouTube videos for offline watching without buffering, ads, loading problem, to fix YouTube isn't working on Chrome. A HD music song video can be downloaded within a matter of seconds, regardless of format, MP4, AVI, FLV, MOV, WMV, 3GP, and more. So far the past few days Youtube videos suddenly stopped working on Chrome. It seems that YouTube videos not loading on Chrome at all. It also works on other browsers. 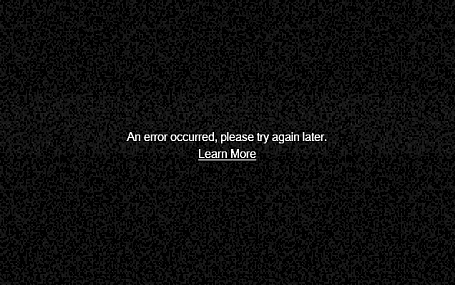 I've also tried Youtube's html5 player, but still no hope. 1. try clearing the browsing data, if that doesn't work, try the next method. 2. disable extensions installed before, sometimes these extensions may cause conflicts. 4. Turn off flags enabled in Chrome. 5. If the problem still exists, try reinstalling Chrome and upgrading it to the latest version. The videos are loading but they just show a static image when I seek to a time. I have tried restarting chrome and my computer to no avail. YouTube video is not playing properly on Chrome—for example, it keeps lagging when playing videos, doesn't load, remains blank, or causes Chrome to crash. 1. Check the internet connection. 3. Reinstall Adobe Flash Player and Chrome and upgrade them to the latest version. 4. If that doesn't help, check if there's third-party program, anti-virus tool, viruses blocking your video. Some YouTube videos not displaying correctly in Chrome, showing only a black screen while audio still plays. Thanks for any help. 1. Refresh the page, if it doesn't solve the problem, install the latest version of Chrome and Adobe Flash Player. Solutions to YouTube videos not playing on Google Chrome may also help to work YouTube black screen out. 2. Head to display/graphics properties, and lower the resolution and color quality. 3. If YouTube still doesn't work on Chrome, switch off the hardware accelleration in Google Chrome. 4.If the Chrome browser isn't playing video, including YouTube video, Dailymotion video, etc. switch to other web browser, like Safari, Firefox. I've been working on an embedded YouTube video on a page. Works fine on desktop browsers. However, the YouTube videos won't play on android-chrome when you touch on the red play button on the center. 1. 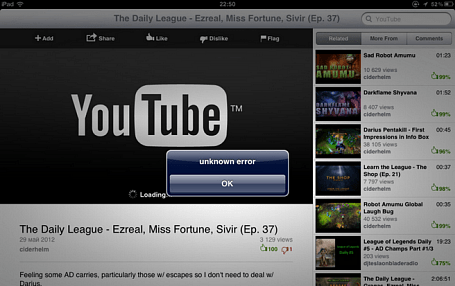 Restarting your mobile devices usually helps in Google Chrome YouTube won't play on iPad iPhone Android issues. 2. Clear browser cache and cookies. For Android, go to Menu > Privacy & Security > Clear data; For iOS, head to Settings > Clear Cookies and Cache. 3. Check if the internet connection is fine or not. 4. Update your devices to the latest system. YouTube not working on iPhone? Fix it!